The Bolognese masters used two types of swords, blunt training swords for practice and competition, and sharp swords as weapons of war, self-defense and the duel. They called the blunt swords spada da giocho, a “play-sword”, and the sharp swords spada da filo, a sword with an edge. For us today, the need of blunt practice swords is similar, but fortunately we only really need sharp swords for cutting practice. A common term attributed to the type of sword used in northern Italy during the 16th century is “side sword”, Italian spada da lato. 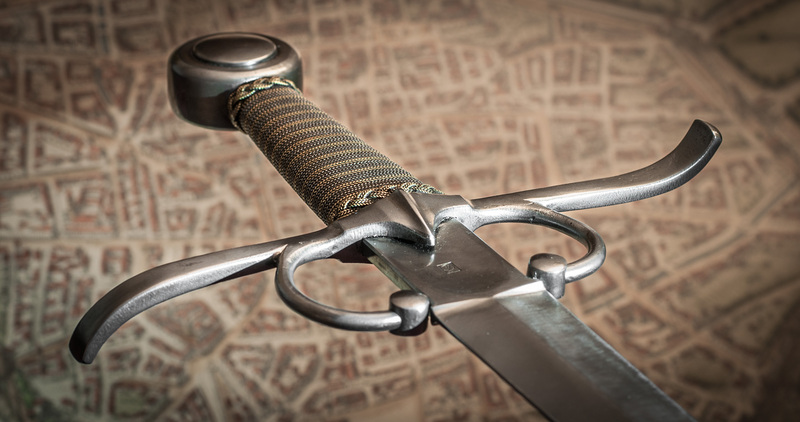 This term is not used by any of the period texts, but I have no problem with using this term since we need distinct terms to separate this type of sword from the earlier arming swords and later rapiers. For Italians at the time every sword was generally just called a spada. I am always looking for new makers of both blunt and sharp swords both for myself and for the use of my students. I don’t really collect swords, I use them. I use them a lot and therefore wear them out in contact practice, which requires me to replace old blades with new as time goes by. At the moment my main supplier for training swords is Periosport, which imports swords made by Péter Regenyei of Hungary. I also use swords from Darkwood Armory in the US. For sharp swords I recommend Vladimír Červenka of the Czech Republic. If you are a smith or swordmaker and you believe you would have weapons we could use, please do not hesitate to email me — we have plenty of potential customers!